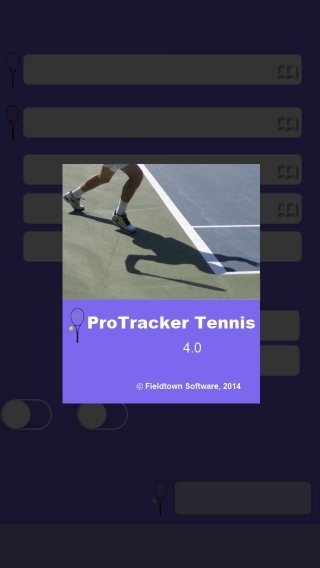 Start ProTracker Tennis from the icon. Enter the players' names, or select them from the drop down lists if you have tracked them previously. 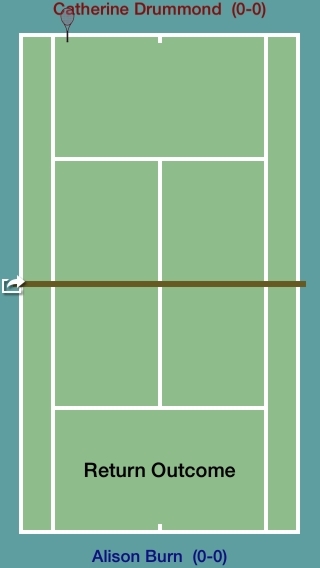 For doubles matches use '+' or '&' symbols between the player's names. Then enter information about the match, the Event, Court surface and Match format. If you are tracking a video of match the date can also be changed by tapping on it. 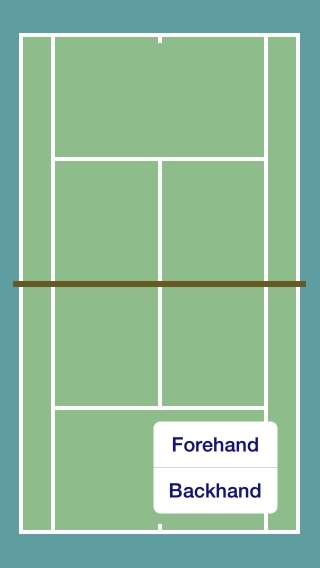 for matches where the first point after 'deuce' wins the game, set No-Ad, where the point is decided at the second deuce, set One-Ad. After selecting the Court Surface you can choose colors for the court surround and inner. 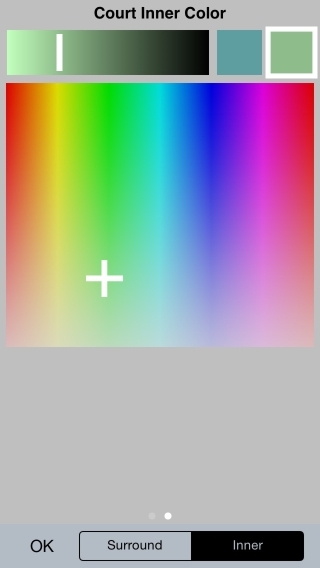 Either tap on the pre-defined colors of select any colour you like using the graded palette and brightness bar. You can adjust the court colors any time you like during the match - something to do during change-of-ends. Tap the Start >>> button to start tracking. The Score screen is displayed. The first thing you must do is indicate which player is to serve first - Tap on the player's name. 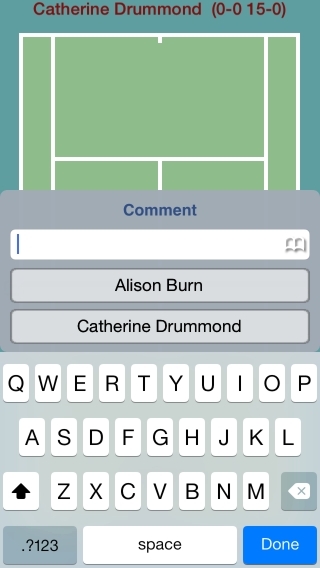 For Doubles matches you will also be prompted to select the player who is receiving serve first. These prompts will be made again at the start of each Set and after the first game of each Set. A Tennis court will be displayed on the screen. 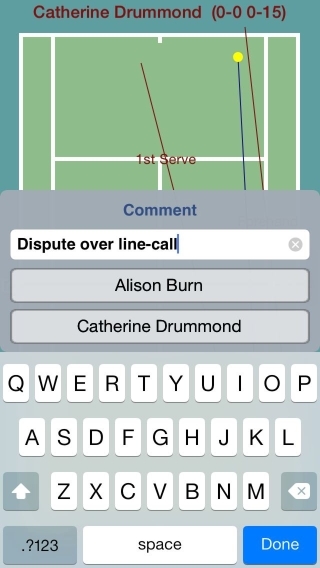 If you are standing at the side of the court, rather than the end, just rotate your iPhone, iPad or iPod Touch and the court will be presented landscape, with prompts and menus appearing correctly. Tap Server End - Tap on the end of the court from which the server will serve. For Serves that are In, Out or Netted Tap on the court at the position where the ball bounced, or hit the net. 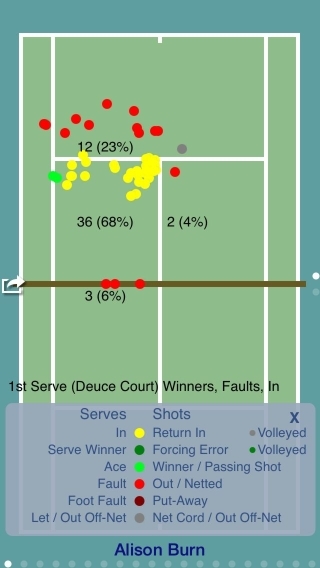 For Aces and Serve Winners, and accurate shot positionning, Touch-and-Move your finger on the court and lift your finger at the position where the ball bounced, or hit the net, select an option from the pop-up menu of outcomes that appears. 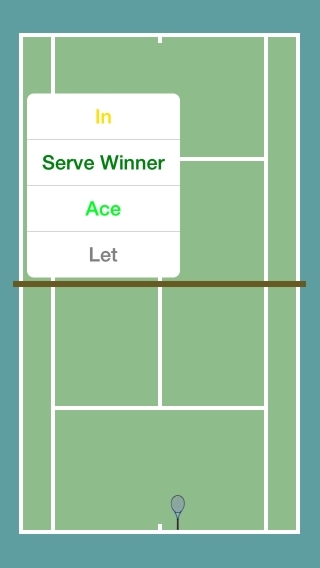 To move the server position, Tap to the left or right of the racket. Tap on the Racket itself to record a Foot Fault. You can choose to have the Shot Outcome menu always displayed by changing the Settings, see the section on this later in the User Guide. Tap Serve Side will appear for sudden-death deuce points. Tap on the side of the court where the serve is being played. This prompt will appear only if you have chosen to track Serve Returns. For Returns that are In, Out or Netted Tap on the court at the position where the return ball bounced, or hit the net. For Winning Returns and other outcomes, and accurate shot positionning, Touch-and-Move your finger on the court and lift your finger at the position where the ball bounced, or hit the net, select an option from the pop-up menu that appears. 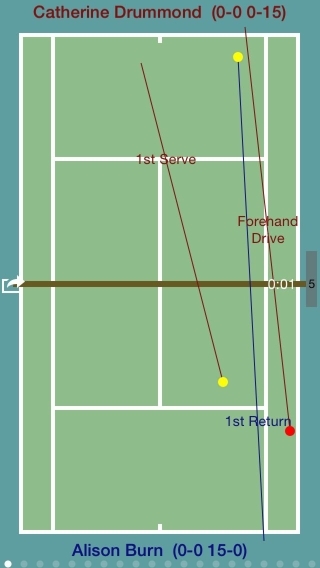 The position from where the Return was played from is calculated from the angle and depth of the serve. It would not be practical for you to tap this in manually. When the point ends decide if the key ending shot in the rally was an error or a winning shot. Tap or Touch-and-Move on the court at the position where the shot was played from. 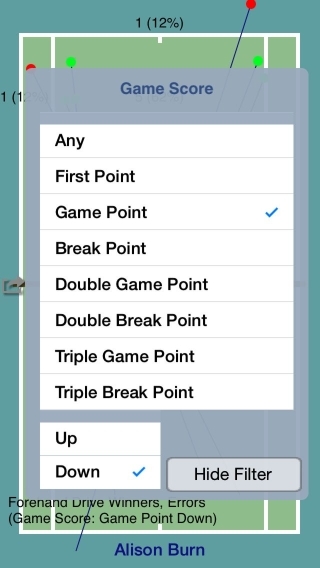 Two pop-up menus of shot types will appear in succession from which the type of shot that was played can be entered. If you are tracking a doubles match, you will also be prompted for the name of the player who made the key shot. 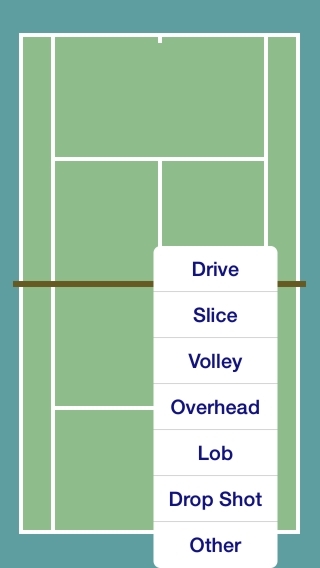 Touch-and-Move on the court at the position where the ball bounced, or hit the net, and select an option from the pop-up menu of outcomes that appears. Tip: the first option in the list is usually the one required and it will be Tapped automatically for you after a short pause - or just Tap the screen for the default option. If you make a mistake Tap the symbol by the net, and select Undo. You can press undo as many times as required to reverse multiple mistakes. Other options are available from this button. You can record Missed serves, returns, points or games - if you don't know who won the point or game that you missed, assign it to '?' and resume tracking - when you next discover the score, record the missed Point or Game again against the correct player. 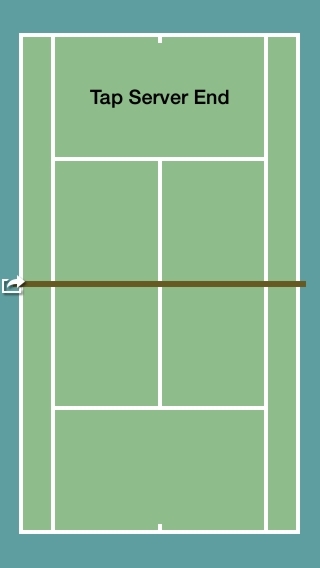 If players go to the wrong end or serve from the wrong end or the wrong player starts serving, which typically might happen after a tie-break, you can follow this by pressing the Switch button. 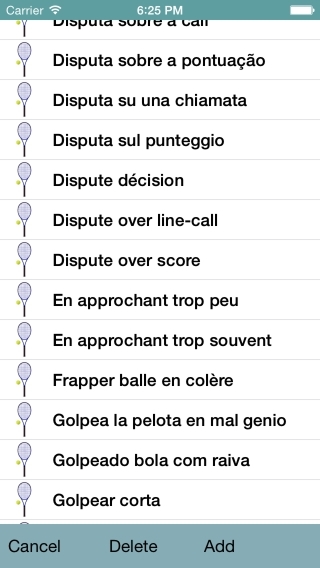 Tip: For No-Ad scoring use the Switch > Serve Court option if the receiver elects to receive in the Ad-court. 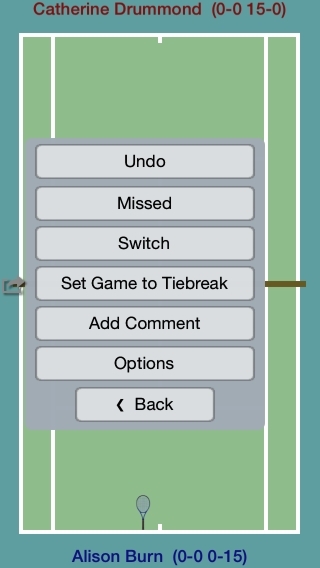 If the player's decide to play a tie-break unexpectedly, this can be indicated with the Set Tie-Break button. This option will only be available when the game scores are even, and its love-all. An important aspect of tracking is to record Comments for future reference. This can either be done from the score form (Actions menu), which is displayed at each change-of-ends, or on the court input form. Pre-defined comments can be entered by clicking on the drop-down list or you can tap-in a new comment (which will then be added to the pre-defined list for another time). Tap the button with the player that the comment refers to on the pop-up dialog that appears. The comments will appear on the Momentum Chart. At each change of ends the score screen will be displayed. On here is a summary set of stats. Press the Continue >>> button when the players resume. Tracking will stop automatically when the match is won or lost. Or, if the match ends prematurely tap the Early End menu option, for retirements, disqualifications or if the match is abandoned. 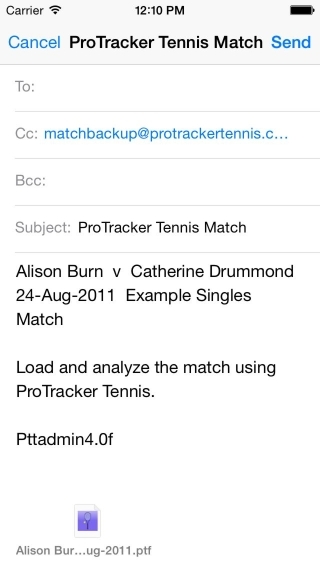 You can now E-mail the match to yourself or a coach who also has ProTracker Tennis, where the match can be analyzed and reports can be printed (PC version). Press the E-mail Match button and enter the To address. Every point tracked in a match is automatically saved to a match file - so you can reload it or e-mail it for later analysis. To load a saved match, enter the players' names and the date of the match and tap the Load >>> button. 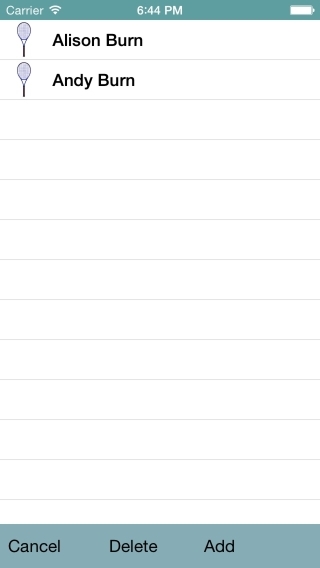 Alternatively you can browse for the match you want from the File > Browse menu option. The option to Sort and Filter matches is available to help find particular previous matches. 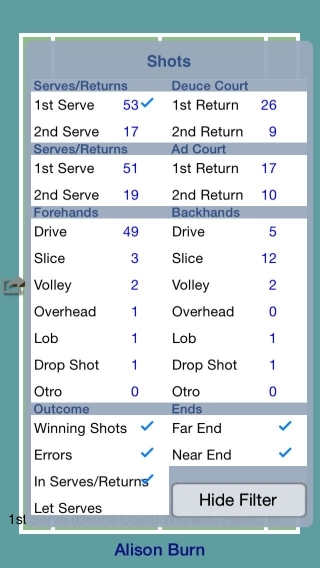 Stats - Detailed statistics can be shown, which can be filtered by Set and Player - for doubles matches, Stats on individual players in a pair can be shown. Tip: Scroll to view more stats and Swipe to view the Stats for individual Sets. 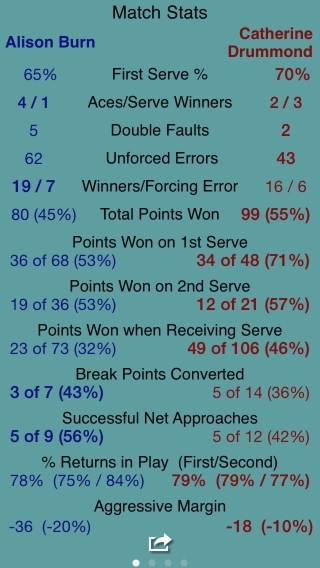 Serve Winners can be separated or counted with other Forcing Errors; and, Forcing Errors can be separated or counted just as Winners. If you are tracking rally lengths, use the slider to change the threshold for winning rally-length stats. The %'age Aggressive Margin is this number as a proportion of the Total points played. Scatter Diagrams – Serves, Returns and Key Shot directions and outcomes can be viewed graphically. 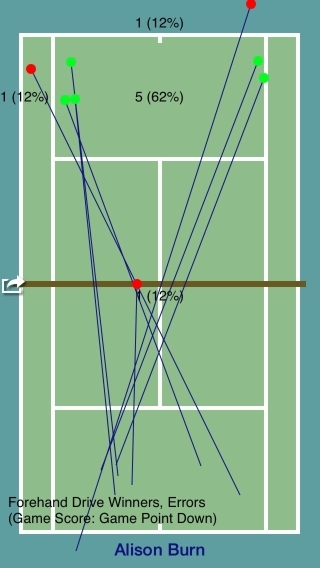 For Returns and Key Shots a line is drawn from the shot position to the bounce position, at which a coloured ball is shown (green for winner, red for out etc.) - a key can be displayed if required. 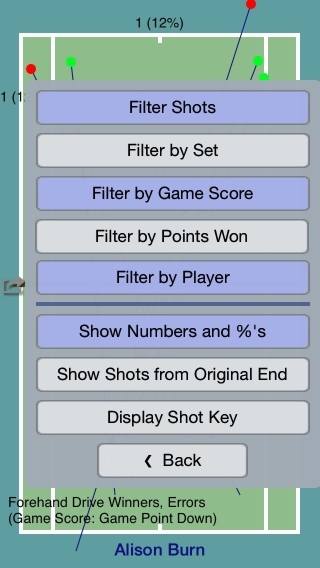 Filters let you select the player, shot, set and game score - so that you can home-in on particular aspects of the play. Tip: swipe left and right to show different shots; swipe up and down to show different players. Useful information can be obtained from the displays, such as which shots are producing errors and where winners are coming from. Numerical Counts and %ages can be overlaid on top of the shots. By default shots from each end are grouped together but they can be separated if required - for example, to illustrate the affect of a strong wind. 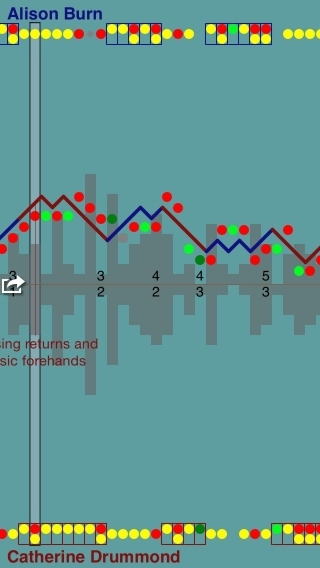 Momentum Chart - The flow of points in the match can be seen to pick out momentum swings and turning points. 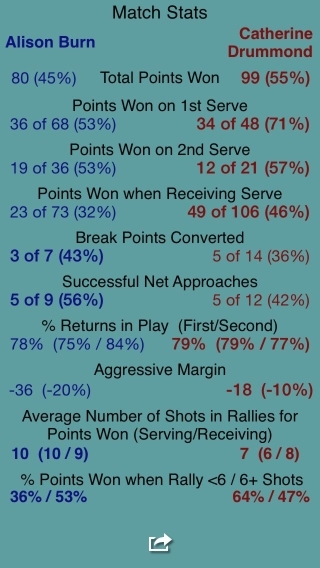 Often an incident during a match, such as a disputed line call or long deuce game, can change the outcome - this chart helps identify this and graphically illustrate it to the player. Each time the player named at the top left of the screen wins a point a line is drawn diagonally upwards, and downwards when the other player wins a point. 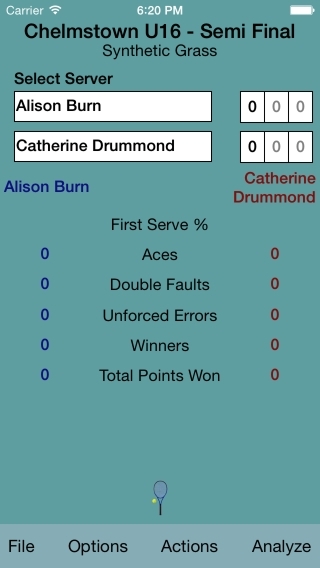 The score and set times are shown along with any comments that were recorded, and the line colour reflects which player is serving. Shot outcomes are overlaid on the chart; the same coloured balls used on the Scatter Diagrams are used. 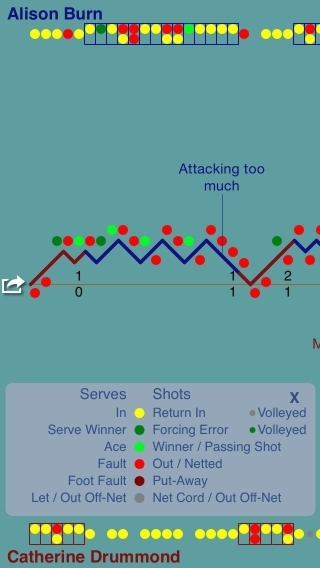 Serves and Returns are shown near the player names and key shots along the match flow line - these enable you to see at what stages in a match points are being decided by winners or by errors, and the impact of serves. You can home in on the detail of a point by selecting the Point Detail option. In this mode the Replay facility is started at the point indicated, and Comments and Rally lengths can be added and amended. If you are tracking rally lengths, these too can be overlaid on the Momentum Chart as gray bars of lengths based on the rally length. This help show if shorter or longer rallies are benefiting a particular player. Tip: all the overlays can be removed and re-displayed as required to help with analysing the match. Replay - Points can replayed one-by-one. Swipe left for the next point and right for the previous point. When Replay is started mid-match the most recent point will be shown, this can be useful to scroll back through a game if players have forgotton the score. 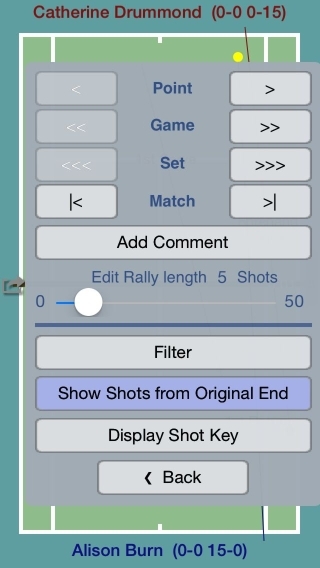 Comments can be Added, Edited or Deleted (by clearing the comment text and pressing one of the player name buttons), and Rally lengths can be adjusted if these were not entered correctly at the time. Tip: use 2-finger swipe left or right to skip to the next or previous Game and 3-finger swipe for the next or previous Set. Tip: use the Match start and end options to insert Commnents before or after the Match. 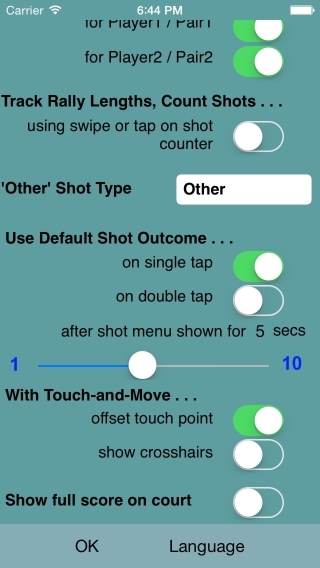 The Options > Settings menu item lets you define the level of tracking you want to do and control how shots are entered. 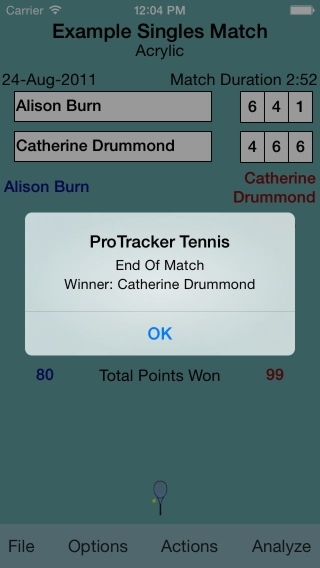 Tracker Name - Your name should be entered here, it is used on e-mails and to record who tracked the match. 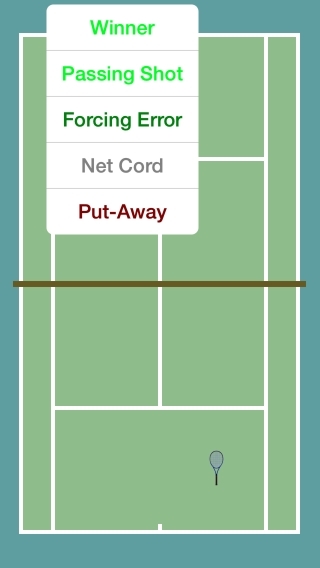 If you don't select the option to Track Serves and Key Shots, only the score will be tracked - buttons will appear on the Score screen to tap-in the player who wins each point. Typically this option would only be used by Umpires. You can choose if you want to track Serve Returns for each player. It is recommended that you switch Return of Serve tracking off if you are having difficulties keeping up with the play. Then turn it on again when you have more experience. 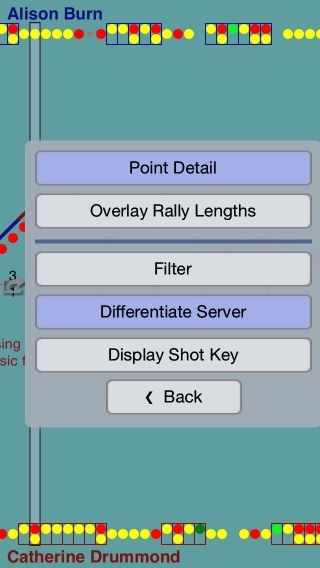 With the Rally Lengths option selected you can record the shots in each rally. 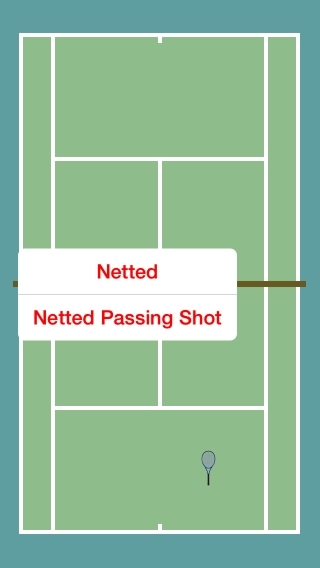 Shot counts are incremented after the Serve and Return have been entered - you need to swipe on the court screen or tap on a shot counter that is displayed when the Key Shot prompt is displayed. You can choose one shot type by changing the Other type. Note, the word used will apply to all you matches. 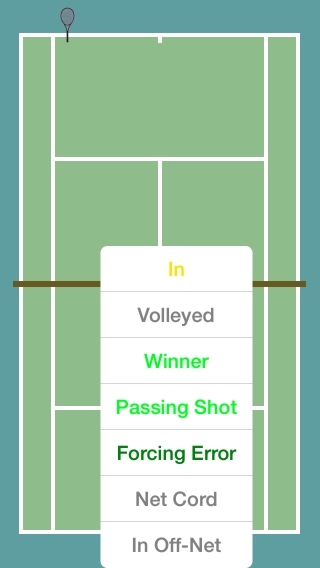 By default when you tap the ball position on the court the normal outcome is chosen automatically: In, Out, Netted or Winner depending on the position and shot type. By using touch-and-move a menu of outcomes is displayed. You can control when the menu of outcomes displayed by setting Use Default Shot Outcome ... on Single Tap or on Double Tap. The default option (which is the first in the list) will also be chosen automatically after the menu is displayed for a controllable time interval of 1 to 10 seconds. Choose the options that you find easiest - you may want to change them after tracking a few matches. Because your thumb or finger would obscure the ball or racket position being input, options are provided when you Touch and Move on the court screen. You can select to offset the touch point above (and to the side), or you can show crosshairs. Both or neither option can be selected. If you want you can to have the full score displayed on the court screen as you enter shots, select the option to Show full score on court. Otherwise only the point score in the game is displayed. 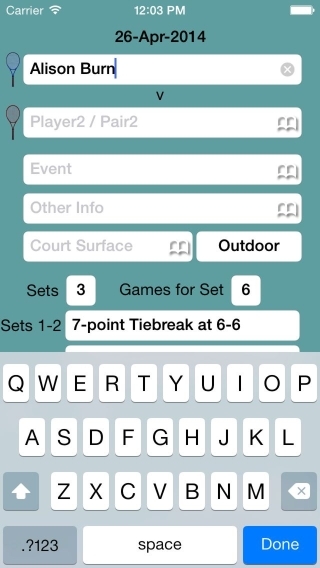 Data - lists are displayed for: Player names, Events, Court Surfaces, Comments and Other Information. 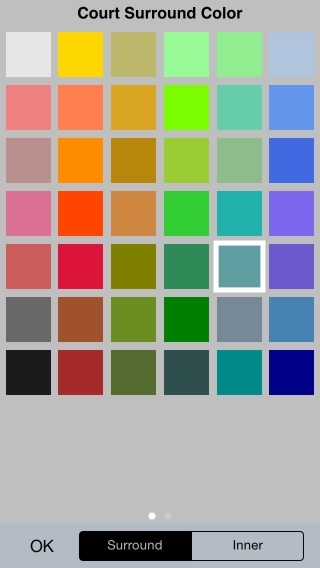 The appropriate list is displayed by tapping the small symbol next to each text box. From each list you can select the text value required, or you can Add a new value or delete a value (by swiping over the text or by pressing the Delete button). When you enter text directly into a field the value will be automatically added to the list, to save you typing next time it's needed. 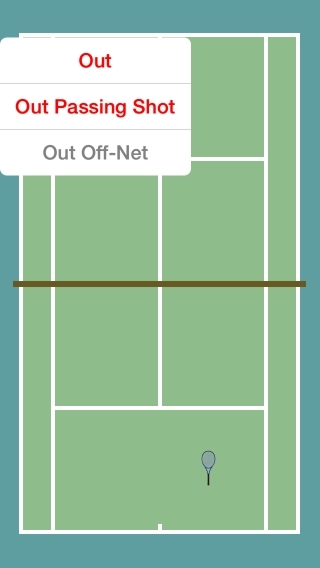 Options used for a match are available, to change the Court colors (Surround and Inner), Line color and Text color - these may need to be changed if visibility is poor or you need to save battery life.